THERAPEUTIC DIFFICULTIES IN ACHIEVEMENT OF OPTIMAL ROOT COVERAGE AND AESTHETIC IN CLASS III GINGIVAL RECESSION. Christina Popova , Antoaneta Mlachkova, Velichka Dosseva-Panova. Department of Periodontology, Faculty of Dental Medicine, Medical University - Sofia, Bulgaria. The width of the attached gingiva is defined as a distance between the depth of the gingival sulcus or gingival/periodontal pocket to the mucogingival junction. Authors suggest that a minimal amount of attached gingiva is necessary to ensure the gingival health. When the buccal bone plate and gingival tissues are thin and the position of the tooth is too vestibular gingival margin often displaces apically, and gingival recession develops. In the presence of gingival recession and reduced vestibular depth oral hygiene procedures are embarrassed. The definition of class III gingival recession is marginal lack of tissue extended to/or beyond the mucogingival junction with bone and soft tissue loss interdentally or malpositioning of the tooth. Prognosis for class III and IV gingival recession is that only partial coverage can be expected after root coverage procedures - FGG (free gingival graft) or connective tissue graft (CTG). Adjunctive surgical techniques would be helpful to achieve better aesthetic outcomes. Key words: gingival recession, FGG - free gingival graft, CTG - connective tissue graft. 9. Popova Chr, Boyarova Tsv. Free gingival autograft for augmentation of keratinized tissue and stabilization of gingival recessions. J of IMAB. 2008; 14(2):19-25. 10. Popova Chr, Dosseva V. Gingival tissue augmentation in conjunction with regenerative periodontal procedures. J of IMAB. 2007; 13(2):16-18. 11. Takkei HH, Azzi RR, Han TJ. 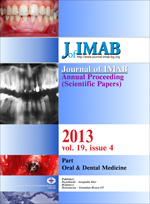 Periodontal Plastic and Esthetic Surgery; Newman MG, Takei HH, Klokkevold PR, Carranza FA. Carranza’s Clinical Periodontology, Tenth Edition, Saunders and Elsevier Inc., p: 1005-1009, 2006.